You can depend upon The Lincoln Herald for historically authentic, accurate, and absorbing stories of Lincoln and the men and women who influenced the unprecedented events of that era. 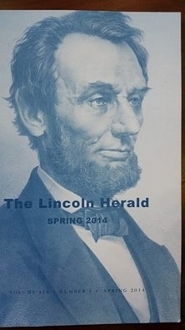 The quarterly published Lincoln Herald is the oldest, continually published magazine devoted to the study of Abraham Lincoln and the Civil War. For Fresh insight into the fast-paced, tumultuous period, subscribe now to The Lincoln Herald.